Thread: First aid kit for range bag. Does anyone have suggestions for a first aid kit for trauma? Looking for a kit for my range bag/bug out kit. Looking for something to deal withe extreme blood loss from either deep lacerations/ puncture wounds to gun shot wounds? What's every one using? I've been looking up first aid kits not finding anything of high quality. Just mostly band aids and gauze etc. I'm fine with piecing to geter just need help with item ideas. Thanx innadvance! Quik Clot is the best coagulant that I have read of. The stuff is amazing. Celox is next, and it is still amazing, but from I have read, it is behind Quik Clot in efficacy. Prehospital use of hemostatic dressings by the Israel Defense Forces Medical Corps: A case series of 122 patients. Shina A, Lipsky AM, Nadler R, Levi M, Benov A, Ran Y, Yitzhak A, Glassberg E.
J Trauma Acute Care Surg. 2015; 79(4):S204-S209. 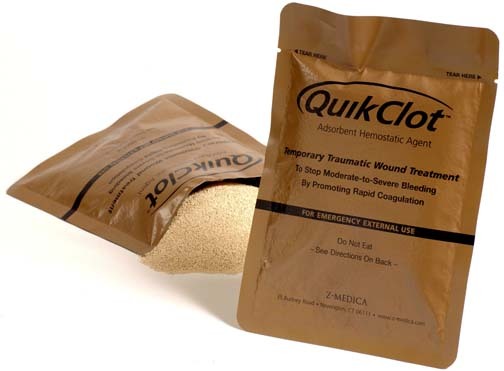 This study compiled 122 prehospital cases where QuikClot Combat Gauze® (QCG) was applied 133 times between January 2009 and September 2014 by the Israeli Defense Forces. Injuries were penetrating (85.2%), blunt (3.3%) and combined (11.5%). Last edited by MisterMills357; 02-12-2019 at 05:55 PM. Google: Skinny medic.com. Lots of Trauma Kits Listed. Look for a "Stop The Bleed" program in your area.